Chris Jericho says it took a couple tries before he was willing to commit to making an appearance at last weekend’s ALL IN event in Chicago. Initially, the IWGP Intercontinental Champion had no plans to participate — noting he hasn’t previously worked any shows in the U.S. outside of WWE. During his latest Talk is Jericho podcast, the legendary wrestler explained his more recent thought process. “Over the course of the last few months, my mindset has kind of changed a bit. I’m enjoying being part of this new revolution of wrestling that’s going on,” Jericho said. Even though Fozzy had a gig in Kansas City that night, Chris says he was open to the idea of a quick appearance if they could get the timing of both shows to work out. Initially, Cody Rhodes pitched the idea of Jericho making an appearance as Burnard the Bear. Jericho didn’t feel it made sense from a storyline perspective — and there were concerns over whether he’d be able to get to his musical gig on time. The second pitch — which included an opportunity to promote his cruise — was right on the money. Initially, the idea was for Jericho to appear as himself and attack Kenny Omega. 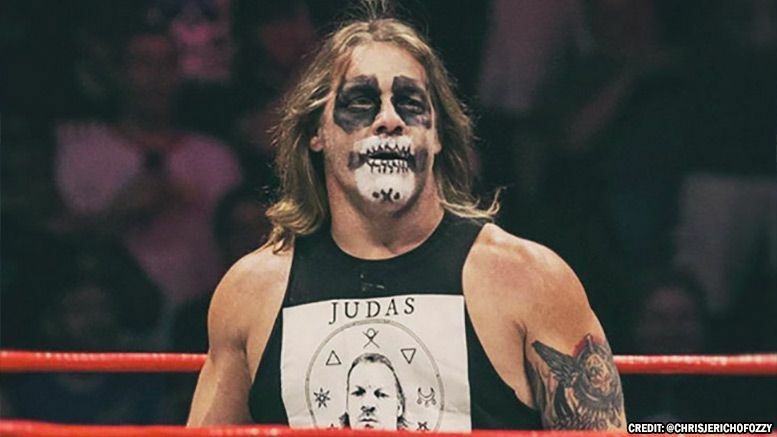 Jericho says Nick Jackson had the idea of Jericho being in the Penta costume. However, there were a few challenges along the way. First and foremost, Jericho said he flew into Chicago at 5:30 p.m. — while the pre-show was taking place — and a fan in the airport saw him. Nevertheless, the surprise didn’t make it to social media. When he got to the area and got his costume for the night, Chris realized the colors weren’t the same as what Penta El Zero was wearing in the ring. Jericho had a friend run to Home Depot to pickup spray paint so he could make the gear silver instead of gold. Up until the last second, Jericho was in the back trying to get the paint to dry. And if all that that wasn’t enough of an issue, security took him to the wrong side of the ring when the lights went out. When he initially entered the squared circle, he was standing in front of Omega. Jericho said he had to walk past Kenny to find his spot and lay down in the ring. Nevertheless, Jericho noted it all worked out and the spot got the ovation he was hoping for. Despite some storms in the area, he successfully made it to KC and performed later that evening with Fozzy. Ah, the joys of producing a live event.